Today, when we talk about the building of the Palace of Parliament, we mention terms such as „democracy” or „democratic institutions”. Associating the term „opening” is not arbitrary, because the International Conference Centre is the pillar ensuring this window. The International Conference Centre was established on May 6th, 1994, according to a Decision of the Chamber of Deputies. The fulfilment of the standards requested in the field of conferences organization brought it the membership of the International Association of Congress Centres (AIPC) in 1997. AIPC granted the International Conference Centre the “Management Excellency Diploma” on a yearly base. Moreover, the International Conference Centre initiated and maintained contacts with ICCA (the International Congress and Convention Association), EFCT (the European Federation of Conference Towns) and AIVFC (the International Association of Francophone Conference Towns). 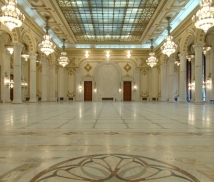 Internally, the International Conference Centre is one of the founding members of the Romanian Convention Bureau (the Association of Professional Conference and Exhibition Organizers) – the only association specialized in this field, in Romania. Due to the favourable reviews received in 2014, the International Conference Centre received the TripAdvisor Certificate of Excellence. The hosting of the works for the yearly meeting of the Crans Montana Forum should be mentioned in the birth certificate of the International Conference Centre, thus supporting Bucharest in its accession to the history of the world diplomacy. Shimon Peres, Minister of External Affairs of Israel and Yasser Arafat, the leader of the Palestine Liberation Organization met for the first time in public at the Crans Montana forum. The meeting resulted in the initiation of the process that led to the creation of the Palestinian Authority. The round table of Governors and Mayors representing the capitals from the Black Sea countries, organized in Bucharest, marked the beginning of the institutionalization process for a specific cooperation framework, offering significant perspective for mutual actions of all participating Capitals, as a new integral part of the Black Sea Cooperation. The creation of the Black Sea Capitals’ Association (ACMN) in May 1998, in Bucharest, marked another important phase of the above process (Rec. 28/1998). The „George Enescu” Festival is a Romanian music event, initiated in 1958, celebrating the memory of the great Romanian composer and violinist, George Enescu. Among the illustrative persons attending this event, we mention Lord Yehudi Menuhin, Lorin Maazel, Zubin Mehta, Roberto Benzi, Sergiu Comissiona, Alberto Lissy, Ghenadi Rojdestvenski, Jean Pierre Rampal, the Royal Philharmonic Orchestra in London, the Bavarian Radio Symphony Orchestra, the Saint Petersburg Philharmonic Orchestra, the Israel Philharmonic Orchestra, the Stuttgart Radio Symphony Orchestra or the Spanish Radio and Television Symphony Orchestra. The parliament representatives of the states participating in CSCE, reunited in April 1991, in Madrid, decided to create the Parliamentary assembly of CSCE (OSCE as of January 1st, 1995). In 2000, at the Palace of Parliament, on the premises of the International Conference Centre, the ninth yearly session of PA OSCE was organized. The summit was the first event of such magnitude ever hosted in Romania, until that time in 2006 – 36 state and government leaders, 25 ministers of External Affairs, 11 Ministers of Culture and Francophony participated in the summit. It was the first Summit of Francophony that took place in Central and South-East Europe. The NATO Summit was organized at the Palace of Parliament, between April 2nd and 4th, 2008. The event reunited almost 3,000 officials from 49 countries: 26 NATO member states and other 23 signatories of the Partnership for Peace. 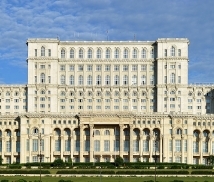 The Summit in Bucharest is considered to have the largest participation and the most complex agenda in the NATO history. Significant personalities took part in the summit, amongst which, the following: George W. Bush, Condoleezza Rice, Vladimir Putin, Gordon Brown, Nicolas Sarkozy, Angela Merkel, Lech Kaczyński, Václav Klaus, Jaap de Hoop Scheffer, José Manuel Durão Barroso and other famous persons of the world policy. The forum in Bucharest had five major themes: energy, agriculture, tourism, IT&C and infrastructure. Collaboration agreements were signed in relation to nuclear energy field, telecommunications and economic and cultural cooperation. The Forum fully occupied the capacity of the International Conference Centre and it hosted the Chinese Prime Minister, Li Keqiang, correspondents from 16 countries in Central and Eastern Europe and 1,000 representatives of prestigious companies from the participating countries. King Juan Carlos I of Spain, Prince Akishino, the second son of the Emperor of Japan, Akihito, and his wife, Bill Clinton, George W Bush, Condoleezza Rice, Vladimir Putin, Gordon Brown, Nicolas Sarkozy, Angela Merkel, Lech Kaczyński, Václav Klaus, Silvio Berlusconi, the Chinese prime minister Li Keqiang, Jaap de Hoop Scheffer, José Manuel Durão Barroso, Albert de Monaco, Philip Kotler, Claudia Shiffer, Michael Jackson, Catherine Deneuve, Ethan Hawke, Vanessa Redgrave participated as special guests at the Forum hold at the International Conference Centre. 21 years after its establishment, the International Conference Centre – reaching its peak in operation through the events it hosted, welcomes the future with international standard services and innovation. With a net area of 13,125 sqm, the International Conference Centre has unique and grand conference rooms, able to host thematic expositions and receptions. Moreover, two restaurant-halls and an assembly room destined for art exhibitions are located within the International Conference Centre. On December 15th, 1993, the Exhibit room named after the Romanian and universal sculpture genius was inaugurated, Constantin Brâncuşi. This room was visibly transformed from a common space into an exhibition room of high representation and selection, becoming attractive for artists, collectors and large cultural circles. On the picture rails of this room, famous Romanian painters were highly exhibited, from Nicolae Grigorescu, Ştefan Luchian, Ion Andreescu, Gheorghe Pătraşcu, Nicolae Tonitza to contemporary artists. The art performance became more and more known, more appreciated and more convincing. 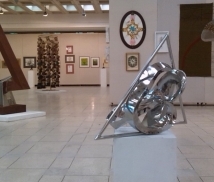 In this way, the “Constantin Brâncuşi” exhibit room gained a consequent and dedicated audience.